Hospital beds and stretchers are predominantly in demand in healthcare facilities across the globe. The beds and stretchers are designed in a manner that they provide patients utmost comfort and secure them from external damage in emergency situations. Moreover, the hospital beds and stretchers currently available in market are indeed designed to facilitate the healthcare professionals. Thus, a shift has been observed from manual to automated beds and stretchers, which offer comfort for the patients as well as the medical professional. The report provides market size and forecast for acute care hospital beds and stretchers. The global report on acute care hospital beds and stretchers market provides market size (US$) and opportunity assessment for acute care hospital beds and stretchers for 2018–2026 by product type and end users. The report also provides qualitative analysis in terms of market dynamics and future growth opportunities for manufacturers of acute care hospital beds and stretchers across the globe. PMR estimates that the global market for acute care hospital beds and stretchers is expected to be valued at US$ 8,741.4 Mn by 2026 end, expanding at a CAGR of 4.1% over 2018–2026. The hospital beds product segment was the leading segment in the global acute care hospital beds and stretchers market with above 86.9% revenue share in 2017, and continue to dominate in 2026. By region, Asia Pacific is the most dominating region, and is expected to expand at a healthy CAGR over the forecast period of 2018–2026 in acute care hospital beds and stretchers market. The global acute care hospital beds and stretchers market is expected to be driven by rise in number of accidents, which consequently increase the number of hospital admissions for elective and emergency care. Besides, increase in geriatric population also creates high demand for technological advanced hospital beds and stretchers for easy arrangements, also drives the acute care hospital beds and stretchers market. 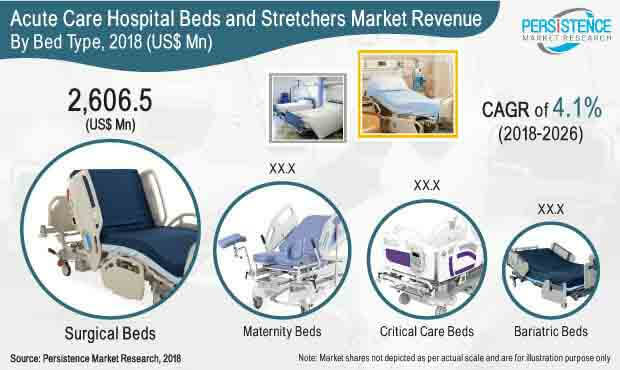 Increasing number of hospitals in developing countries and high demand for maternity/birthing beds are also the key factors expected to propel the growth of the acute care hospital beds and stretchers market globally. Additionally, growing awareness regarding early diagnosis and treatment has directed the acute care hospital beds and stretchers market to grow at a significant rate. The developing healthcare infrastructure, government initiatives and growing healthcare investment are the other factors driving the acute care hospital beds and stretchers market. Increasing out-of-pocket healthcare expenditure in both developing and developed economies has created the need for proper implementation of hospital beds and stretchers. However, despite the efforts of governments as well as manufacturers to improve the landscape of acute care hospital beds and stretchers, lack of hospital spending in under developing nations is expected to restrict the growth of the global acute care hospital beds and stretchers market. The global market for acute care hospital beds and stretchers is segmented in to five key regions viz. North America, Latin America, Europe, Asia Pacific and the Middle East and Africa (MEA). Asia Pacific accounted for a leading share in 2017 in global acute care hospital beds and stretchers market, and is expected to witness rapid growth over the forecast period. The global market for acute care hospital beds and stretchers is dominated by the key players, contributing more than 70% of the market share. The key players operating in the global acute care hospital beds and stretchers market are Invacare Corporation, Hill-Rom Holdings Inc., Stryker Corporation, LINET, Getinge AB, and Paramount Bed Holdings Co., Ltd. Midmark Corp., and Howard Wright Limited, are some other manufacturers present in acute care hospital beds and stretchers market. Launching new products and acquisition are the key strategies adopted by the key players in the acute care hospital beds and stretchers market.